Fitted out with its own workshop. Inside the Cycles4U store in Namibia. 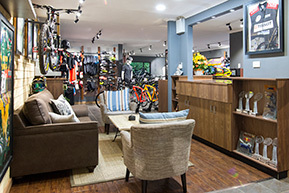 Specialized Bicycles Africa has introduced a very unique retail model to Southern Africa: it offers cycling retail outlets the opportunity to form partnerships under its Concept and Elite umbrellas, in exchange for assistance with existing store upgrades and store fittings. 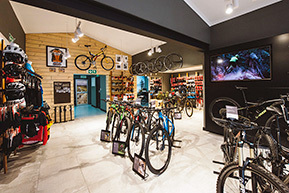 Whatever the level of partnership, the revamped stores all have a distinct, modern, customer-friendly layout with areas for relaxation and each cycling category like women, kids, MTB and road cycling grouped in a designated area. Apart from a workshop, they also offer the services of a Body Geometry Fit studio to help customers choose the right bike. tomers can chill out. Photo: Andrew Mc Fadden. 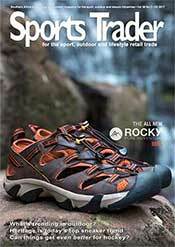 It has so far partnered with 31 stores: 28 in South Africa, 2 in Namibia and 1 in Botswana. Of these, less than half (12) are concept stores where close to 100% of their stock is Specialized branded product; 12 are elite stores that sell mostly Specialized branded products, but may also stock another two cycling brands, and 6 retail independently and stock Specialized alongside any other cycling products of their choosing. The brand has one company-owned store in Stellenbosch, which also hosts its head office. “This store is more of a test bed for us and gives us a chance to understand retail better, test new systems and teach staff from all the stores around the country, whether it be in sales, the workshop or our Body Geometry Fit course,” says Kristy Yeld of Specialized Bicycles Africa. inside Complete Cyclist Hout Bay. Image: Cherie Vale. Hout Bay’s Complete Cyclist, Pietermaritzburg’s Greg Minnaar Cycles and Swakopmund’s Cycles4U stores are the latest additions to the Specialized Bicycles family. Complete Cyclist joins its two older sisters in Johannesburg, which became part of the Specialized family almost three years ago. 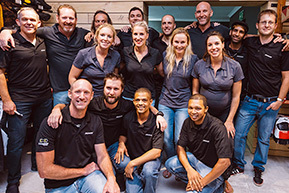 “The support we get from the Specialized team is like no other and their business model is one that works seamlessly with ours,” says Scott McKenzie who owns Complete Cyclist Hout Bay. s Africa. Image: Cherie Vale. The store has not only gained a Specialized Elite Store logo on its storefront, but also an upgraded workshop, new staff members, revamped layout and a Body Geometry Fit Studio. 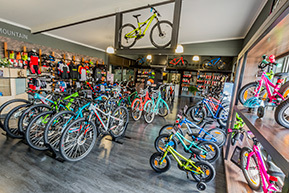 Greg Minnaar Cycles in Pietermaritzburg is situated within cycling distance of the Cascades MTB Park where the MTB World Championships has been hosted on numerous occasions. “What was once an old house is now a beautiful store,” says Yeld. The store has almost doubled its workshop size and features a comfortable coffee area and bar counter where customers can chill out and catch up, a pool in the front for if ever customers need a quick dip after a ride and a pump track for the whole family to enjoy. Cycles4U is the second Namibian store affiliated with the brand. The 160m2 store with an additional 40m2 workshop area has an open layout that makes the small size look and feel bigger. It features designated men’s, women’s and kids areas and caters for the riding needs of the whole family. It also has a fully equipped bike studio to help improve fitness levels, as well as a Body Geometry Fit studio, where the owner Alfons Kiesewetter himself has been trained to get customers properly set up on their bicycles.